Here at Lewisville Estates, we have a 24-Hour Fitness Center. You can be active and improve your overall fitness level anytime you want. We also offer group classes such as Sit ‘n’ Fit, Chair Yoga and Tai Chi. Oh, the places you will go while here at Lewisville Estates. Just leave the driving to us. We’ll get you to the doctor, take you to a movie or wherever you need to go. We have reliable, scheduled transportation for all our residents. Your safety and well-being matter to us 24/7, 365 days a year. That’s why we provide 24-Hour Full Assisted Care—if you need it. We also equip every apartment with Emergency & Care Call Systems that are monitored 24 hours a day. Speaking of 24, did we tell you our fitness center is open 24 hours a day too! At Lewisville Estates, we create an individual personalized care plan for every resident. We also have a licensed nurse and wellness center, healthcare coordination, incontinence care, medication management and allow on-site home health and therapy agencies to come in as third-party vendors. Retirement living as it should be—leave the maintenance to us. At Lewisville Estates, we offer a fully licensed Assisted Living Community on premises. We have health services oversight, bathing assistance, diabetic management, morning and evening dressing / grooming, bathroom assistance, assistance with meals, creative, full-time activities program and comfortable lounges for socializing and relaxing. We don’t just talk the talk, we walk the walk. Heck, some of us even walk the pets! We know how much your fur babies mean to you, that’s why we are a pet-friendly community. We also offer weekly housekeeping and linen services, ancillary supplies, a billiards and poker room, a real general store, coffee bar, TV lounge and even a theater. Lewisville Estates has many opportunities for you to make new friends and enjoy each other’s company. We treat our residents like family. It is imperative to our staff that we continuously enhance the life of our residents. We take great care and pride in how we hire and whom we choose to work at Lewisville Estates. 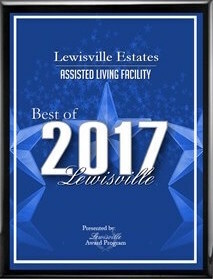 Lewisville Estates is a well-maintained and established retirement community offering Independent Living and Assisted Living. We at Lewisville Estates pride ourselves on our welcoming attitude to all that come through the door. We enjoy giving attention to our residents’ individual needs providing them the esteem and comfort of home. At Lewisville Estates we believe our hospitality and care is demonstrated not only by our long-term residents of 10+ years, but the commitment and longevity of our staff.